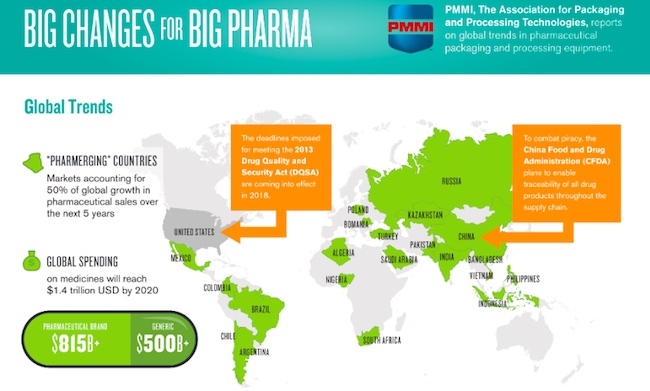 “Pharmerging” countries, atypical innovation and an increase in generic drugs from expiring patents, are helping create unprecedented growth in pharmaceutical packaging and processing, according to a new 2018 Pharmaceutical Packaging & Processing White Paper and accompanying infographic from PMMI, The Association for Packaging and Processing Technologies. By 2021, global pharmaceutical brand spending is forecast to approach $830 billion, while generic expenditures will push past $500 billion. As the pharmaceutical marketplace continues to globalize, the expanding middle class in “pharmerging” countries—China, Brazil, Russia, India, Algeria, Argentina, Colombia, Bangladesh, Indonesia, Mexico, Nigeria, Pakistan, Poland, Saudi Arabia, South Africa, Philippines, Turkey, Romania, Chile, Kazakhstan and Vietnam—now have access to supply chains and more importantly, money, for healthcare. An aging population, coupled with competition from generics manufacturers stimulating demand for new products, has the pharmaceutical industry in the rare position of driving packaging innovation. Long an issue for vertical markets like food and beverage, pharmaceuticals are now feeling constant pressure for speed and efficiency to navigate rising demands from new medications, global markets and the doubling senior citizen population. As the most comprehensive trade show in North America in 2018, Healthcare Packaging EXPO, co-located with PACK EXPO International (Oct. 14–17; McCormick Place, Chicago) provides solutions from across packaging to ensure pharmaceutical manufacturers can keep pace. Produced by PMMI, Healthcare Packaging EXPO delivers the latest in pharmaceutical packaging technologies among its 300 exhibitors catering to the pharmaceutical, medical device, biologics and nutraceuticals industries. Additionally, the 2,500 exhibitors at the combined event offer attendees real-world examples that can cross-pollinate from other markets for application in the life sciences. Pharmaceutical professionals also have access to free educational presentations on increasing automation, incorporating the Internet of Things, and improving asset utilization at the four Innovation Stage locations on the show floor. The Forum at PACK EXPO is another opportunity for an exchange of industry knowledge with the OpX Leadership Network, World Packaging Organisation, Institute of Packaging Professionals, Contract Packagers Association and PMMI Business Intelligence.